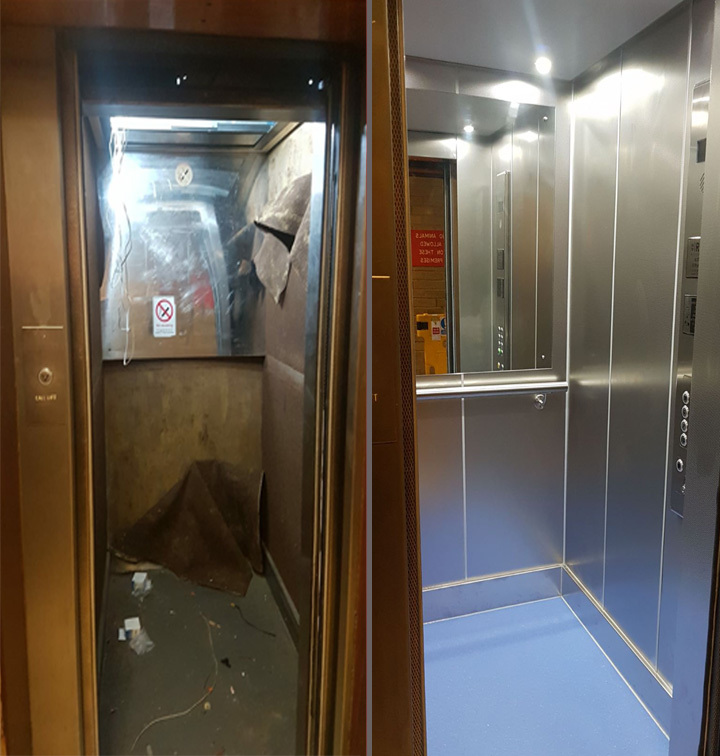 A full electrical refurbishment on an eight floor passenger lift completed on schedule. 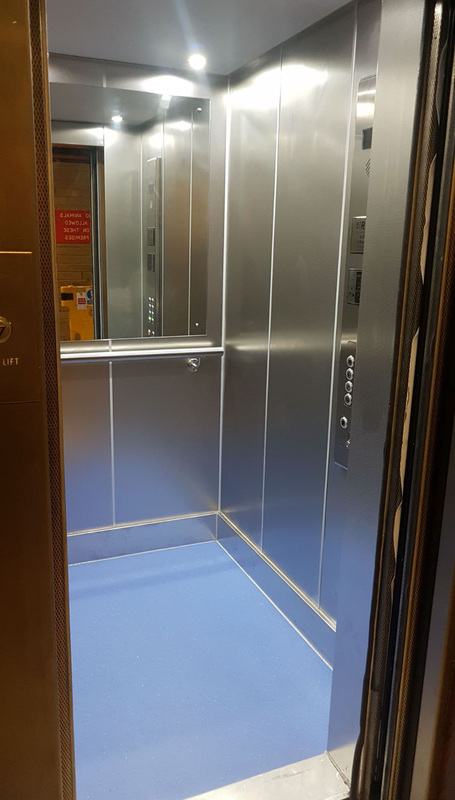 We specialise in lift refurbishment for lifts of all sizes in all industries; everything from a high-speed hotel lift to a heavy-duty lift in a large factory. We update lifts to ensure reliability and efficiency whilst adhering to the latest standards using the most up-to-date technology. energy efficiency, lift stability and ensures a smooth lift operation. R J Lift Services Ltd provide national coverage and has lift engineers working throughout the UK. 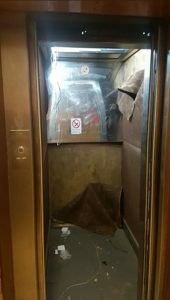 This means we can start refurbishing your lift interiors at a time that suits you. As we are one of the leading independent lift companies we also guarantee a highly competitive rate. Every building has its own theme and every company a brand image. Our vast selection of designs, materials, colours and control panels means that we can your lift can complement the exact image you want to present. Updating your lift may be a necessity; but redesigning your lift car is a sensible choice. 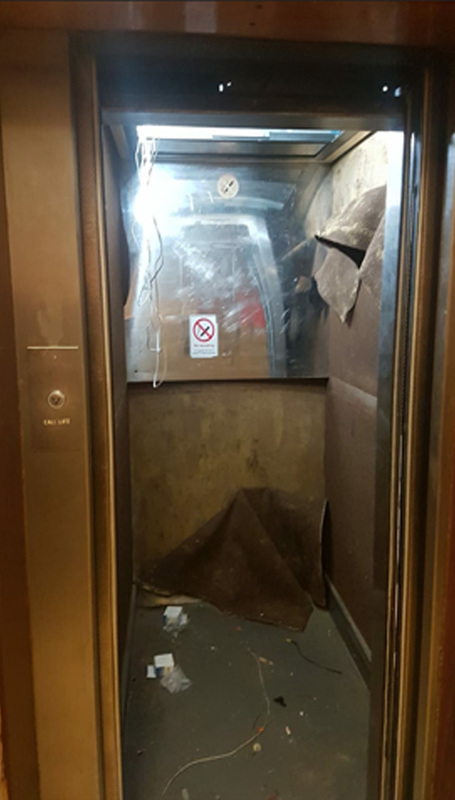 Complete re skimming of all personnel-facing panels (inside and outside the lift) to replace scuffs and scratches with a smooth and shiny finish. A choice of over 450 different materials and colours. Bespoke designs and walls printed with designs of your choice. This could be an enlarged logo or an image that portrays your company’s culture and values. Replacement control panels, lift direction arrows and buttons to give the lift a modern look. Colour LCD displays for your lift control station. This can be fully-customised with different colours, backgrounds, and logos. Electrical refurbishments – old lift wiring is one of the most common causes of breakdowns. We offer wiring updates to severely reduce the risk of breakdowns, breakdown costs, and add increased lift efficiency. New energy-efficient LED lighting with emergency batteries ready in the event of cut-outs. Disabled-friendly lift designs required by Health and Safety and DDA regulations. We can also include audible signalling to aid the visually impaired.